PHARMACEUTICALS AND HEALTHCARE: The way forward...medical videos/graphics for story telling! The way forward...medical videos/graphics for story telling! Look at the science of storytelling here! Pharmaceutical marketers are always on the look out to tell the product story in a novel and riveting way - rightly so! The print form of visual aid, literatures, reminder cards, and supporting small gifts like pens and stationary items, seem to hold the fort forever as collaterals to the story telling done by pharma marketers. It has been so, for many decades. And we have this ostrich-like attitude that this method will continue to do so! Truly, most pharma marketers have buried their heads, like the proverbial ostrich, into the sand! While the world is surfing ahead on a digital tide, pharma marketing seems inured to the radical social changes happening through bits and bytes. The time of a concerted change in pharma marketing through digital route has come of age! Pharma marketing is insidiously being drawn into the spectre of digitisation, before long digital storytelling will be the way forward and the current crop of pharma marketers will lose the plot! The way forward is digital oriented pharma marketing. It is about making use of graphics, videos, pictures, infographics, and other digital memes to create a digital culture of pharma marketing and storytelling! 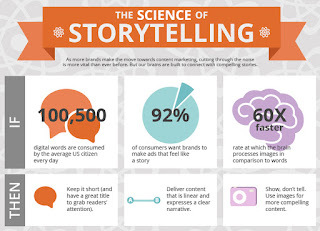 Many laymen feel 'stories or storytelling' is about untrue or exaggerated accounts! However, please note, dear reader, in marketing parlance, a 'story' stands to the way a brand is presented through various anecdotes, facts, figures, similes, idioms, phrases, visuals, examples, collaterals, storyboard... so on ... to captivate the listeners or viewers of the story on the brand promise or benefits!! Stories are the oldest way of knowledge transference and help in consumption of ideas/goods/services/experiences, creating new lifestyle patterns. Apple the iconic brand is a success through word-of-mouth passage of experiences. In fact, digital means Apple, and the rites of passage into the digital world for all is being smart, with a smart phone in hand. Whatsapp and sms, browsing, social media and other smartphone enabled messaging are the most influential vehicles for influencing perception change. Storytelling the clinical successes of pharma products is no more ONLY through print media - digital tools are here to create immersive experiences of storytelling! When I did field work in Mumbai recently, I saw a poster of a pharma company, in a clinic (at the patient waiting area). It invited me/patients to register their mobile number by sending a sms to a given number. I did the same...today in the name of the doctor (in whose clinic the poster and number was given), I get weekly health tips! Now that is smart digital marketing - the sponsor pharma company provides a health messaging service in the name of the doctor to patients, and this is not only strengthening the doctor patient bond, it will nurture the pharma company and doctor relationship too! Pharma marketers, now have to work on digital push and pull processes. Digital content richness will create the change. Let us assume, a product marketing specialist makes a 60 second video on how his brand of etoricoxib has greater affinity to COX 2, and thus reduce pro-inflammatory prostaglandins in the inflamed or damaged tissue, in a colourful and vivid manner using cutting edge graphics, and if this video is subscribed/shown on the tab by the medical representative during in-clinic or in-booth activities, there is excellent traction for the brand. The doctor also appreciates the video based knowledge transfer. In fact, in coming months and years, it is such skills - to help produce infographics, graphics, short movies, memes and other digitally created material that will enhance the pharma marketer's value. Imagine a pharma marketer creates a 10 minute video content on how a certain antibiotic reduces the in-vitro growth of pathogenic bacteria on growth media in petri-dishes, and co-relates this evocatively to a patient's journey from infectious disease to recovery from infection, the doctor who spends watching this on his smartphone or tab or through the tab being shown by the medical representative, will have greater confidence on the marketed brand showing this video! While the digitization trend will gain strength in pharma marketing messaging to create unusually attractive stories, it will be fuelled by the fact, that quality medical representatives are hard to come by today. The medical representatives of the 1960s and 1970s era are just not made today! It was their traditional role of being the pharma company's messenger and relationship builder with doctors. However, today, less contact time with doctors and low quality of communication by field personnel will increase the digitization trend irreversibly. So the firm trend to put forth pharmaceutical storytelling in a digitally eloquent manner is creating change in pharma messaging. No one can be insulated from major trends in society, unless we are ivory tower marketing specialists! So happy digitally inspired pharma marketing! Please scroll down and read all other posts, do click on older posts and read them too...recommend this blog to your acquaintances! In today's world, disease like to stay, for we are full of hurries! Take a breath, slow down your pace, learn to let go things you cannot grasp...be at peace too! You owe it to yourself. MRs = Medical Representatives who are the storytellers to the medical profession.